The american amateur Edmund B. Durham, 3VM, in 1914. This skilled OM who built two receivers, emitted in CW with 30 W using a 12 m high, 22.5 m long "T" antenna tuned on 180 meters. Document Spark Museum. Like any scientific story, we cannot relate the venture of amateur radio without considering the socioeconomic context that saw its emergence. You will thus find in the next pages not only the story of amateur radio but also the one of the other discoveries and inventions that lead in a way or another to the development of radio communications. To respect the History we have tried to use the vocabulary of the concerned time, using for example the megacycle (Mc) until 1960, when the Système International (SI) was adopted. This study deals mainly with the amateur radio in the U.S.A., not only because it represents the largest ham community in the world with about 30% of licensees, but first of all because they have initiated many activities that have been later "exported" and used abroad. However to please the international community of amateurs, we have tried to not forget the history of amateur radio in the other countries, in Canada, in the United Kingdom, in Belgium or in Japan to name some countries. This story being quite long and representing a lot of information, we have tried to make it the less boring as possible and the most alife as possible. To help you to find quickly the information you need, here are the key dates and events in a few landmarks. Here is how all this story began. Come back in time. By 900 BC, in his "Odyssey", Homer dealed with "a golden chain of exquisite workmanship strung with amber beads that gleamed like the sun" that received Penelope as a gift. In the 1st century BC, in Imperial Rome, Pliny the Elder reported the discovery of a strange property of this matter called amber. This yellow and translucent gemstone made of fossilized remains of tree resin was probably one of the first stone offering so-called curative properties against deafness and blindness, while once burnt its characteristic scent of pine had redolent of purification. Today the price of these amber drops can still be high, mainly when they content inclusions of bugs, flowers, etc, that lived on Earth during the Jurassic or Eocen time. The specimen displayed at left for example, extracted from my collection, is roughly 40 millions years ! This close-up is enlarged 2.5x. But this stone had another property, still stranger. After have been rubbed with wool or by fur it is able of attracting thin objects like feathers, leaves and fibers. 600 years BC the famous Greek philosopher Thales of Miletus called this special property "elektron", from which is derived the latin word "electrocus" meaning " produce from amber by friction", and of course the modern word "electricity". In fact the amber is able of storing electricity and to produce discharges of static. However, we had to wait the years 1800s and the works of Michael Faraday to discover the true relationship existing between electricity and magnetism. But his works were not associated to mathematic developments. So, in 1873 the Scotsman James Clerk Maxwell "redesigned" these concepts in mathematical form and invented the electromagnetic waves. Today, Maxwell's equations are always used to calculate characteristics of waves that they propagate in a tube receiver or a satellite antenna among other applications. Maxwell created the fundamental concept of "field", giving up the one of electric fluids in ether. "The field" told he, "creates a canvas across all the sky". This property allows Maxwell to predict the existence of (electromagnetic) waves. Outside the field, the force has no effect. It is for this reason that outside the electromagnetic field of a broadcasting station, we cannot capture its emissions. Before Morse invention, signaling systems were first vervals but there were not really efficient except in whisling or using wind or percussion instruments. Then the signaling systems became visual. At the end of the XVIIIth century, the French Claude Chappe invented the semaphore or "optical telegraph" to transmit messages over long distance. The characters constituting the messages were defined by the position of arms. Placed on top of towers or on distant hills, the operators used flags or lights to send coded messages from one station to another. But the system was limited. It was quasi inefficient at night or when there was fog or heavy showers. In the 1800s the young American republic offered a prize of $30,000 to the inventor offering a more efficient system able to cover the entire Atlantic coast. Samuel Finley Breese Morse accepted the challenge. Morse didn't at all began his professional life in the field of electricity or any other related area. Born in 1791 - yes, in the 1800s ! - he was a painter and sculptor graduated from Yale College, and had opened an art studio in 1823. The legend tells that he had the idea of using electricity to communicate over distance during a conversation aboard the ship Sully when he was returning from Europe in automn 1832, at 41 years old. The ship's passengers were discussing about the Michael Faraday's recently invented electromagnet, when Morse came to understand how it worked, and began speculating that it might be possible to send a coded message over an electric wire. Between 1835 and 1836 Morse invented a first code made of numbers associated to a dictionnary to use with a key to fasten communications. The message was recorded on a long moving strip of paper. To the operator's skills to decode and interpret the message in real time, and to transcribe it into numbers and letters as he heard it. But it was not the Morse code yet but rather a telegraph code that requested a dictionnary to code words. 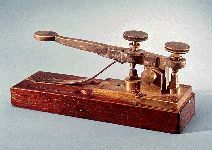 By December 1837, Morse had enough confidence in his new system to apply for the federal government's appropriation, and during the next year he conducted demonstrations of his telegraph both in New York and Washington. However, after the economic disaster of 1837 that caused a true panic followed with a long depression, nobody was interested in his invention and Morse was forced to wait for better times. In the meantime he visited Europe again and met in England Charles Wheatstone, the inventor of a competitor electric telegraph system. After the meeting, Morse realized that his system was far simpler, more efficient, and easier to use. In January 1838, thanks to the help of Alfred Vail, Morse gave up his telegraphic dictionnary where words were represented by number codes to use a simpler solution, coding each character with one or more dots and dashes. This method eliminated the need to encode and decode each word to be transmitted or received. On January 6, using an electric conductor 5 km long, for the first time he transmitted successfully the letters of the alphabet using his new code. The Morse code was born (unfortunatelly will say the gossip ! ). Recall that the Morse code invented in 1835 is a system of representing letters, numbers and punctuation marks by means of a coded signal sent intermittently like the two samples displayed below demonstrates. These pure tones travel much easier than a modulated voice across QRM. Even weak signals emitted at 5 W pass through interference or fading, hence the power of this mode of communication. The characters sent were associated to abbreviations representing words or full sentenses to fasten communications in limiting the risk of error. 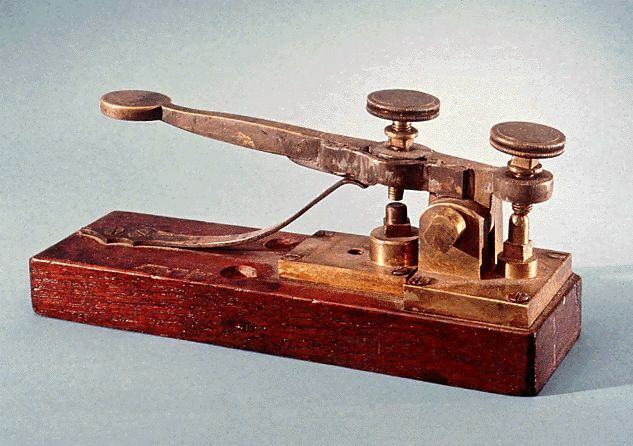 But as soon as 1854, the hundreds telegraph companies existing across the USA charged their transmissions based on the length of the message sent. By 1866, Western Union merged with the American Telegraph Company, and as did all european telegraph companies, they participated in the expansion of Morse family fortune. 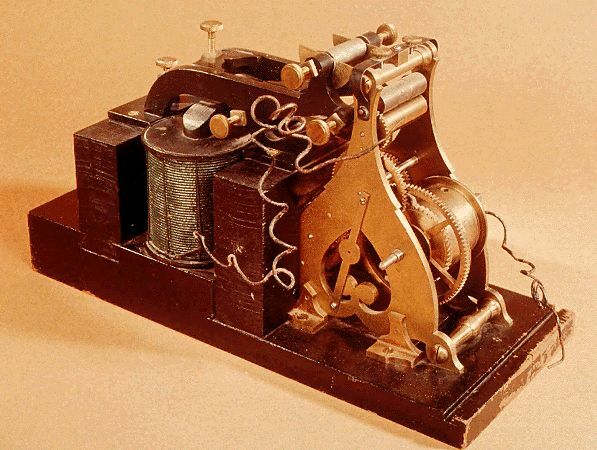 More confident than ever, owning an efficient transmission code, in 1843 Morse submitted his invention to the Congress asking for the $30,000 that would allow him to build a telegraph line from Washington to Baltimore, located 60 km (40 miles) away. The House of Representatives agreed and the Senate approved the bill in his last session. President Tyler signed the document on March 3, and Morse received the cash to build his first telegraph line. Engineer Ezra Cornell had the intention to place the electric wires inside a pipe when Morse discovered that Congressman F. O. J. Smith, had purchased wire with defective insulation. As the deadline approached, to fasten the project Cornell suggested that the fastest and cheapest way of connecting Washington and Baltimore was to string wires overhead on trees and poles. Desperated, Morse agreed and the line were hanged on poles. And it is this way that on May 24, 1844 the wired telegraphy was born in a dramatic way. Morse sent the telegraph message "What hath God wrought ?" between the Supreme Court chamber of the Capitol building in Washington to the Railroad Depot station in Baltimore. The message was received on a roll of paper and is always kept at the US Library of Congress archives. 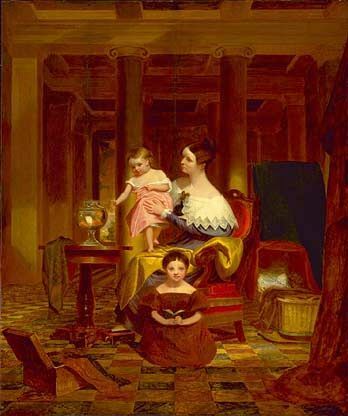 At left a painting made by Samuel Morse circa 1935, entitled "The Goldfish Bowl, Mrs. Richard Cary Morse and Family", an oil on canvas showing his sister-in-law and her children. At center Morse's telegraph used to send his famous sentence in 1844. At right the straight key that he used during this memorable transmission. Documents Library of Congress and Smithsonian Institute. Soon, a wired mesh connected cities from New Jersey to Florida using the new Morse code. Telegraph lines soon extended westward. In 1850, about 20 telegraph companies installed an estimated 19,000 km (12,000 miles) of telegraph lines across the United States. In 1854, the U.S. Supreme Court upholds Morse's patent claims for the telegraph. All U.S. companies that use his system began to pay Morse royalties. Morse won the jackpot of the century! By 1855, the British and French built their first telegraph lines for the Crimean War. For the first time governments were able to communicate directly with commanders in the field, and newspaper correspondents "cabled" their first reports right from the front. This is during the Civil War of 1861 that the US Army understood the essential role of telegraphy in his strategy, and it constitued one of his major tactical tool. 1858 : First transatlantic cable laid down between Europe and the U.S.A.
On March 10, 1854 the first Atlantic Telegraphy Company is established in New York, Newfondland and London with a capital of $1,5 million. European side, the London Atlantic Telegraph Company was registered on the 20th October 1856 with a capital of £350,000. The company objective is to lay down a telegraphy cable between Newfoundland and Ireland. The US government granted to the company a 50 year monopoly on landing cables. Location of the first cable laid down across the Atlantic in 1858. 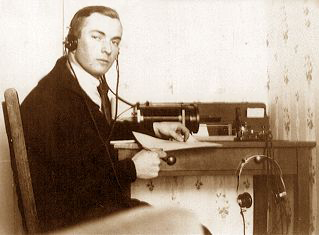 Doc Atlantic Telegraphy Company. 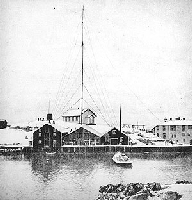 From 1858, the first cable is laid down across the Atlantic. The cable is made of 7 strands of #22 BWG copper wire. After have surpassed and resolved many difficulties, the telegraphy cable was operational in August 1858. The chronicle reports that "in all 732 messages were sent before the cable finally failed on the 20th October 1858." 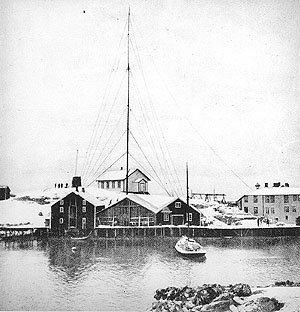 The antenna of the first northern Europe wireless telegraph service installed at Røst, Norway, in 1906. Document Norsk Telecom Museum. At the same time, to develop the economy associated to the fishing industry, in 1861 the Norwegian parliament (Stortinget) granted funds to extend the telegraph line from Sørvågen, to Røst, Værøy and the Lofoten headland, creating the first fisheries telegraph service in Norway. According to the Norsk Telecom Museum at Sørvågen, the stations were only open four months, during the fishing season. In 1868, the Lofoten Line was linked up to the main Norwegian network, and from 1873, Sørvågen Telegraph Station was open all year round. This activity increased the yield of the Lofoten fishery for both the fishermen, the merchants and the state, creating in the vicinity many new jobs in these fishing villages. The telegraph reinforced the security of fishermen, e.g. in sending them weather bulletins, and improved their job in given them information about the location of fishes. It is in 1906 that this network linked all the rest of the country, giving birth to the first northern Europe wireless telegraph service. After the mitigated success of transatlantic communications, communications between Europe and the U.S.A were restored in 1866. The broken cable of 1865 is raised and repaired, and soon two cables are operational. By 1880, an estimated 160,000 km (100,000 miles) of undersea telegraph cable have been laid between both continents ! 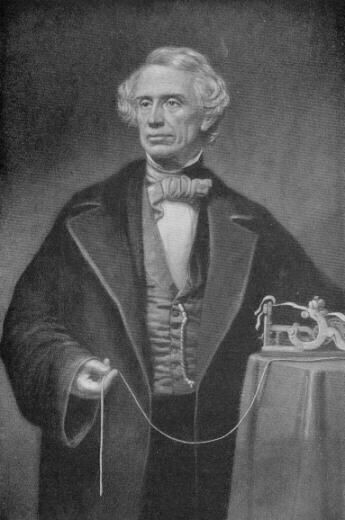 Samuel Morse died on April 2, 1872 in New York City at 81 years old. He is buried in Greenwood Cemetery, Brooklyn. We can say that he was the father of all Silent Keys, in both senses of the word.